More of everything is the theme of the third annual Play2Learn Festival slated for September 8 at the Harrison Public Library. This year, the award-winning extravaganza will have more hands-on activities, more entertainment, more refreshments, and more fun and prizes, according to Festival organizers. 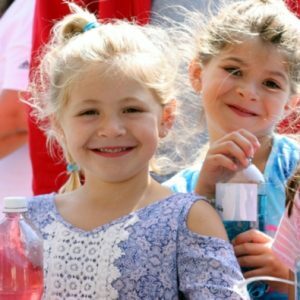 The Harrison Public Library’s Play2Learn Festival is set for Saturday, September 8, 11 AM to 3 PM at Riis Park in front of the Halperin Memorial library downtown. It’s free to the public and promises to delight both kids and parents while showing them how play can be a learning process. New to Play2Learn this year is the NatureStation, the Rye Nature Center’s new mobile workshop that features over a dozen activities to teach people about the natural world they live in. The immersive exhibit features a quarry, forest, wetland, and garden. More than 40 hands-on activities will be offered at the Play2Learn Festival, nearly twice as many as the first two years. The eight play zones are themed for physical, music, creative, science, make believe, technology, construction, and sensory activities. There are games, experiments, projects, and experiences for kids of all ages. Parents are encouraged to participate, too, since one of the goals of the festival is to expose them to the play-to-learn concept. There will be additional food trucks and refreshment options, lots of live music and entertainment, and a new feature this year—prizes for those festival-goers who participate in multiple activities. Admission is free, although families are asked to register in advance at www.harrisonpl.org/play-to-learn so the HPL Foundation can better plan for the event. Sponsors and donors make the Play2Learn Festival possible, according to HPL Foundation President Dave Donelson. “We are very grateful for the support we receive from generous individuals and companies who step up to invest in our children,” he says. Nearly 50 donors and sponsors support the festival. The Harrison Public Library is at 2 Bruce Avenue in Harrison, NY. For more information, visit http://www.harrisonpl.org/play2learn.